If there was ever a city to devote a large portion of travel time to, it’s St. Petersburg. The stunning architecture alone could potentially keep you (and your camera) busy for days, but the city is also home to numerous world-class museums, cultural venues and restaurants to impress even the most jaded traveller. It’s not a city you breeze through, but more an exploratory trip through history, and one that leaves most visitors wanting more. Check out some of the best things to see and do in town, handpicked by our knowledgeable local St. Petersburg tour guides. There are museums — and then there’s the Hermitage. Home to over three million works of art and other historic artifacts housed in multiple buildings, this is the type of place you need to devote significant time to. If you can, make two (or even three) shorter visits rather than trying to see everything in one shot. Two paintings by Leonardo da Vinci, a sculpture by Michelangelo, numerous works by Monet, Cézanne, Van Gogh, Gauguin and Matisse — and that doesn’t even come close to scratching the surface. The museum is free on the first Thursday of every month, but expect extra-long lines. Considered Russia’s most famous street, Nevsky Prospekt is a place you will likely end up strolling at some point during a visit to St. Petersburg. Stretching 4.5 kilometres and filled with some of the city’s best shopping, restaurants and attractions, Nevsky Prospekt is accessed by five metro stations and four bridges. In terms of what you can find here (in addition to the aforementioned retail therapy and abundant options for filling your belly), the street and its surroundings are also home to the impressive Kazan Cathedral, Church of the Savior on the Spilled Blood with its colourful onion domes and intricate decoration, as well as Eliseyev Emporium (stop in for some Russian foodie souvenirs), and the beautiful Singer Building, now home to the city’s largest bookstore. If there’s one beverage that is synonymous with Russia, it’s vodka. Located within restaurant Russian Vodka Room No. 1, the Russian Vodka Museum details the origin and history of vodka from the 14th century to present day. You’ll learn about the products traditionally used to ferment vodka in Russia, as well as the role vodka has played in Russian culture over the centuries. The museum also features an exhibition hall decorated like a traditional Soviet vodka room, which is also where you get to taste three different types of vodka and learn about the nuances of each. As you sip, check out the world’s largest collection of Russian vodkas, consisting of over 260 types. Tours and tastings run for 35 to 45 minutes. You might think “Venice” when you think of canals (and you would be right), but St. Petersburg isn’t referred to as the Venice of the North for nothing. A popular way to see the city is on one of the many tourist boats that traverse the canals and the River Neva. See about hopping on a tour around Nevsky Prospekt (available May to October) to see some of the city’s 365 bridges before cruising through the centre of town back to your starting point. 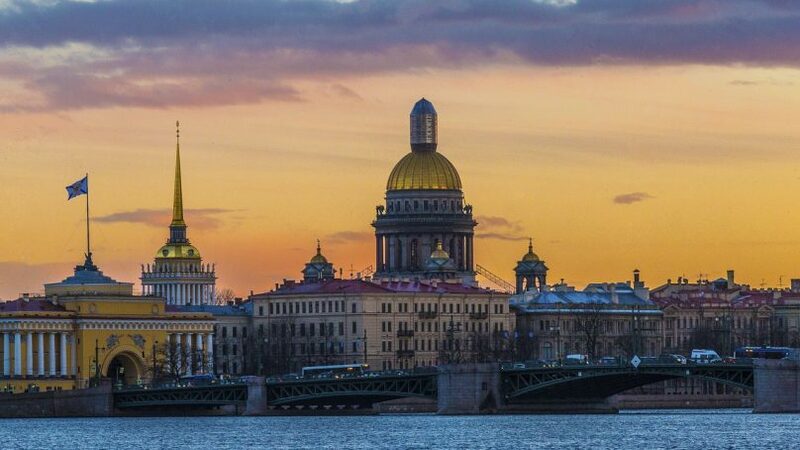 From late May to early July, the days in St. Petersburg are exceptionally long, something caused by St. Petersburg’s very northerly geographical location. During this period, the city is in a celebratory mood and one of the best cultural events takes place. The White Nights Festival brings the city together, with both locals and visitors taking advantage of the exciting events on offer, including art, music, opera, ballet and film, as well as huge outdoor celebrations.